By Christian Takushi, Macro Economist & Geopolitical Strategist, Switzerland – 8 Nov 2018. Since 2015 we are warning that the US-Iran Deal has set the Middle East on a path for two wars, and that Saudi Arabia would clash with an assertive Iran before a regional alliance shall take on Israel. Our analysis also points to Israel entering a Peace Treaty. Against that backdrop, the belligerent actions between Saudi Arabia and Iran of the past 36 hours are a prelude and foreshadow of the clash that is coming. Many geopolitical observers that have been overly focused on Brexit, Ukraine and North Korea have been caught by surprise by the acceleration of the proxy war in Yemen and are raising alarms over impending war between Riyadh and Teheran. There is a great advantage in an independent non-ideological analysis that enabled us to foresee this conflict. Since it is part of our main scenario we are monitoring the different actors, and see no reason to sound alarm bells. More worrisome than this latest escalation is the rapid contagion throughout the region involving Turkey, Israel and Kurdistan. Under growing threats, Israel is ready to enter the Syrian battle field to take on the growing Iranian forces there. But the fact that Israel has pre-announced it, shows to us that CENTCOM (US Central Command) is preferring to showcase Arab-Israeli unity against Iran as a deterrence first. This has Iran and Turkey now thinking how far they want to go to support their wayward Western allies. If the Israeli Defence Forces (IDF) want strike, they move with unwavering resolve and you’ll hear of it after it has struck. Why are Arab states arming themselves? Cairo and Riyadh see the US-Iran Deal effectively shielding Iran’s missile program and Teheran procuring enriched material with the hard cash. Although the likelihood of an armed conflict between these arch-rivals has been growing since 2015, the real action is yet to come. When it finally unfolds it will expose an unprepared Europe to multiple nuclear and security threats. Brussels might be able to escape the worse, but only at a high price. I expect the geopolitical map of Europe to change as a result. The West has not only further destabilised the Middle East by destroying regimes that kept the region from spinning out of control, it is also unprepared to deal with the follow up. While Japan, Australia and Israel recognised the signs of the time and upgraded their militaries to face the future risks, the old continent bet on a new era of peace via trade. Sadly, the EU didn’t invest to protect those Trading Routes. It even “scared” away its only member with a superb global set of strategic military bases and credible military deterrence, the UK. All the way from the Bosphorus to Japan, none of the past conflicts and atrocities there have been properly dealt with or wholeheartedly apologised for. Diverse Oriental cultures and religions made it additionally hard. While the near and far Orient were poor, few could afford to care about the many simmering conflicts and open wounds. But as wealth increased, the Arms Race started. Although those patched over conflicts are now driving geopolitical and economic policies, the West is mainly concerned with saving Trade and Business Deals. Still unable to learn from history: explosive trade growth has flaws and many big wars have been preceded by cross-border trade booms. This is where geography meets politics and economics: Any future major conflict in the Middle East, South Asia and East Asia will affect the vulnerable Trading Routes that link Asia and Europe; sending insurance costs, Oil and Food prices higher. Future geopolitical events will shock those economies that highly depend on those routes for a significant part of their fuel, supplies or exports: The European Union, China, Japan and South Korea. At the first signs of the coming conflagration, the Japanese and Swiss economies might still be seen as safe havens, but Japan will soon turn out to be too geopolitically and macro-economically vulnerable to be a haven. As Turkey, Israel, Russia and the USA are pulled into the conflict to one extent or the other, the USA – as sole global military superpower still – is likely to meet the soaring demand for safety. There is a major difference between a systemic risk and the risk of large scale war. And this may expose consensus and standard risk models again as unprepared or backward-looking. Many nations have political & economic power, fewer have geopolitical power, and fewer yet have overwhelming military power. As Catalonia has just experienced, without the will to go to war for freedom and the shield of a foreign military power, independence is elusive. When it comes down to protecting and shielding the Trading Routes on which global trade highly depends on, three geopolitical powers have the upper hand: the USA, Russia and Great Britain. They have the combination of strategically located military bases, aircraft carriers and effective nuclear deterrence to project military power. As we have warned since early 2016, Brexit made the EU a geopolitical dwarf and pushed the UK further into the US Strategic Military Alliance (we call it USMA), which comprises nations strategically committed to the US-led Alliance and with the firepower to back it up. These are nations like Britain, Israel, Japan etc. – They are able to unleash war and project power effectively to defend US forces and US territories. The EU is far away from it, making NATO a dysfunctional and asymmetric alliance that bears more risks for the USA than benefits. To make matters worse, Berlin’s deepening strategic ties with Beijing over the past decade have raised many question marks about Berlin’s true allegiance. This helps explains the quiet yet growing unease among US military leaders about NATO – it is not just the view of the White House. Given this ambiguity it makes sense for the USA to pretend it supports NATO still. The security demise of Continental Europe began when the EU decided to dismantle her strategic military forces and expand territorially – It took two decades for Europe’s military divisions to end up existing mainly on paper. Need an example? France at war needed four days to effectively mobilise 3’000 troops after the Paris terror attacks of 2015. Paris and Berlin can mobilise highly effective brigades, but you can’t defend a continent with a few brigades. A continent void of strategic foresight at its top is trying to rearm, but this comes too late. The EU can neither defend herself nor can it effectively defend any ally before 2022 at the earliest – It is a burden to the USA and Canada with plenty of open fronts. Brussels’ relentless territorial expansion into the East awakened nationalist fervor in Russia and aided the rise of Mr. Putin. China‘s growing geopolitical umbrella for Germany could help the EU over time mitigate a reduced US defence commitment though. Europe and China are sharing ever more economic and geopolitical interests. But, while China’s Silk Road is reaching the Middle East, the military umbrella doesn’t quite reach the old continent yet. Consensus overlooks that Europe and America began taking different paths over a decade ago – Take the refusal of Paris and Berlin to adopt the F-35 Joint Strike Fighter some 20 years ago. The continuous commitment to renew the Nuclear Deterrence at Sea over the past decade sets Britain apart from the rest of Europe. The F-35 is not just a next generation fighter, it is a vital platform. North American, British, Israeli, Japanese Armed Forces among other nations share this formidable stealth multirole fighter. The talk about shared values doesn’t impress military leaders, not least as those values are diverging too. Saudi Arabia and Iran seem to be at the center of a fury of events. No doubt, the Middle East is where all things will eventually converge, but this latest tug of war seems to be also part of the raging ideological conflict between liberal forces and conservative forces, with epicenter in the USA and Europe. As conservative forces are trying to mobilise Arab states and Israel, liberal forces are trying to mobilise Iran for their own means. With the Democratic Party (DNC) and Mrs. Clinton facing their biggest scandal in recent history, the current disinformation war took on new dimensions – on all sides. The presumed rigging of the DNC primaries in 2016 was kept a side note as Western capitals mobilised to ensure public attention stayed elsewhere. Just as Mr. Kerry defended the US-Iran Deal, the new Saudi leader had probably the biggest Clinton donor arrested in an anticorruption push. Hours after this unprecedented move Pro-Iranian forces were reported aiming missiles at Saudi Arabia from Yemen. Saudi Arabia sees this as an act of war by Iran, but observers know that both states are technically at war with one another in Yemen already. I don’t think this is the “next” Middle East War yet. More technically, neither Saudi Arabia nor Iran have had enough time to fully deploy all air defence systems and upgrade their missile programs for maximum deterrence (i.e. with nuclear warheads or other WMD devices). Those extended-range missiles could reach European cities as early as 2020, making Europe a “prisoner” of the Middle East theatre. Once again Europe’s compromised ethical resolve and appeasement of assertive powers would have backfired. European leaders are de facto under the dictate of the oligopolies they have nurtured and the assertive geopolitical powers they have enabled. As we have noted before, Europe will be forced to embrace more political power concentration. Two risks could accelerate the slow-grinding conflict though: a move against Kurdistan by Turkey-Iran and Israel entering the war in Syria. Let us make no mistake though, Iran and Turkey along with China are rising as geopolitical powers. Great cultures with renewed confidence and supportive Western allies are seeing a new dawn. Teheran and Ankara have made their strategic goals explicit, thus the clash with Israel is just a matter of time. Tectonic shifts in the realms of religion across the near and far East are driving or facilitating the geopolitical developments we are discussing. I reiterate that Religion is the most underestimated Geopolitical Factor of our time. Christian Takushi MA UZH, Macro Economist & Geopolitical Strategist, Switzerland – 8 Nov 2017. General Disclaimer for all our research: We provide geopolitical-political analysis only. Global Geopolitical Macro Analysis is highly complex and subject to sudden changes. No analytical method is without certain disadvantages. We may change our outlook within less than 3-6 hours following an event. 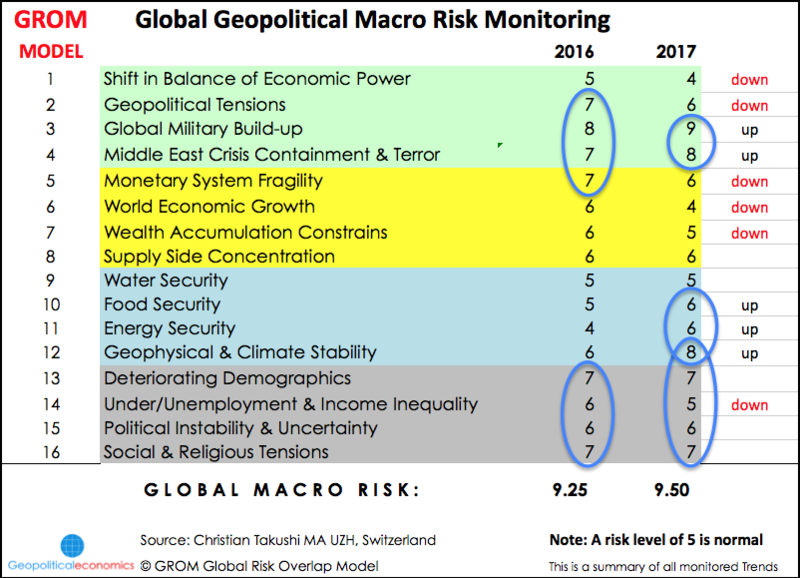 Global Geopolitical Macro Analysis can be extremely time-sensitive. No comment should in any way be taken as an investment recommendation or suggestion. One and the same assessment at the geopolitical or macro level can lead to very different rational actions, because every nation, company or portfolio has different risk tolerances, assets, goals and restrictions.